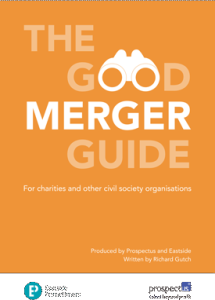 The Good Merger Guide is a step by step guide illustrating how charities, social enterprises and other not-for-profit organisations can explore and implement mergers. The guide has two aims; to highlight the main questions to consider before embarking on a merger and to then provide step by step advice on the three stages of managing a merger (exploration, planning and due diligence, implementation). It is particularly targeted at small and medium sized organisations already considering merger as a possible option and wanting to know more about what is involved. Although the guide discusses legal issues, it does not offer legal advice and readers should seek professional advice on any legal issues as necessary. It was co-published with Prospectus. If you have an enquiry or would like to know more about upcoming publications, please contact us at elliot@ep-uk.org.